Multi-Touch Equipment Market size is set to exceed USD 20 billion by 2024; according to a new research report by Global Market Insights, Inc. The global shipments are set to grow at 12% CAGR between 2018 and 2024. Multi-touch equipment market is projected to grow due to several benefits offered by these devices including flexibility, enhanced performance, and fast operations. These devices help users from various industries to have a better control over their resources and situation on the field, resulting in ease-of-work. Greater situational awareness and central overview will lead to an effective decision-making thereby spurring the demand for these devices. The multi-touch equipment market will witness growth owing to the ability to provide a streamlined interface with other devices such as POS terminals, video games, etc. The multiple points of the finger contact on these components allow the customers to perform simplified and expedited interaction with the devices. The multi-point interactivity enables fast scrolling, pinch-to-zoom, and intuitive gesture commands. These features allow intuitive and quicker interaction of the users with the host device, increasing the popularity of these devices. The introduction of the Windows 7 operating system and the built-in multiple touch programming capabilities have resulted in the growth of multi-touch equipment market growth. This has enabled easy and low-cost implementation of multi-touch capabilities on tablets and laptops. The OS has also created a platform for the development of Human-Machine Interaction (HMI) software applications. This allows the company to invest in the development of HMI software packages for PCs and development tools for smartphones & tablets. 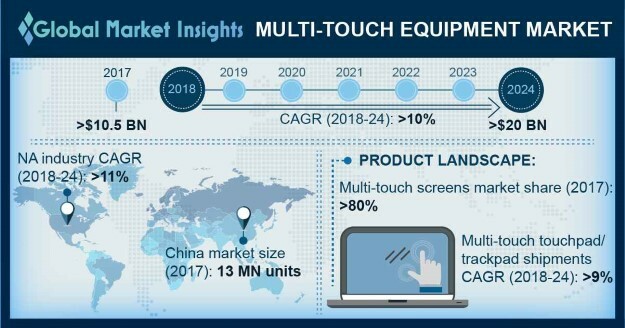 OEMs are facing several issues such as the minimum size of the screen and better life of the devices pertaining to the implementation of multi-touch technology in their devices, restraining the multi-touch equipment market growth. The screen size of the devices with this technology needs to be big enough to accommodate multiple touch points. This is likely to increase the cost of the devices. Furthermore, the implementation of this technology in the devices requires a large amount of computing power, impacting the battery life of the devices. Trackpad/touchpad will exceed over USD 1 billion by 2024, propelling the multi-touch equipment market growth. These components are being increasingly used in gaming devices for an enhanced player experience. The development of an add-on navigation touchpad to allow multiple touch points capabilities is providing several opportunities for the industry growth. Companies, such as Ergo Touchpad and Logitech, are developing low-cost touchpads that are easy to use and can be easily installed on a computer with a USB. The development of intelligent and interactive kiosks will propel the multi-touch equipment market growth over the forecast timespan, with kiosks accounting to about 10% revenue share in 2017. The kiosks equipped with these components focus on increasing the effectiveness of transaction experience, enhancing the user experience, and supporting an engaging transaction with the customers. These devices are being increasingly used in healthcare, retail, and hospitality industries. For instances, in June 2018, McDonald’s announced that it will add self-order kiosks in their 1,000 stores every quarter. These will be equipped with multiple touch points technology, providing growth opportunities to the industry. The multi-touch equipment market will grow rapidly due to its increased adoption in the education sector. Growing trend of e-Learning is fueling the use of advanced electronic devices such as laptops and tablets for learning. The educational institutes are shifting from the interactive whiteboards toward the multi-touch display walls due to projector requirements and the high costs associated with the interactive whiteboards. Several companies are developing software to implement the technology in classrooms. For instance, Snowflake MultiTeach, developed by NUITEQ is a collaborative K-12 multitouch software that provides personalized learning experience. The North America multi-touch equipment market is expected to grow with a CAGR of over 11%, due to the large-scale adoption of devices including tablets and laptops. Growing demand for wearable technology and usage of other technology-intensive products will aid in the industry growth. The industries in the region, such as 3M and U Touch, have high investment capabilities to adopt advanced technologies. The consumers in the U.S. and Canada also have a high acceptance of advanced technologies, encouraging the industries such as entertainment and retail to adopt these products. For instance, retailers are replacing the traditional EPOS and in-store videos with these systems to enable customers to access live customer support and product guides. Key vendors in the multi-touch equipment market comprise Microsoft Corporation, Fujitsu, Japan Display Co., Ltd., Displax Interactive, LG Display, Samsung Electronics Co., Ltd., Cypress Semiconductor Corporation, and Wintek Corporation. The industry is highly competitive in nature with the presence of several regional players. The companies are developing innovative products to gain a substantial share in the industry.